Each fall, student entrepreneurs at UMBC pitch their big ideas – Shark Tank-style, no less – for potential funding. And each year, their ideas span disciplines, including everything from a comic book series featuring a new brand of hero, to hydro-powered water bottles designed to track water consumption. Now in its eighth year, the Alex. Brown Center for Entrepreneurship Idea Competition is just one of several ways UMBC is helping to turn students’ ideas into reality, providing monetary prizes for startup funds, and advice from alums and others who can help them along the route to success. “I think this competition is an amazing opportunity to help young adults have the confidence and ambition to go beyond just spitballing ideas,” said Karla Negrete ’19, mechanical engineering. Negrete and her partner Nathan Eschbach ’19, mechanical engineering, took home first place and a $750 prize for their Puncture Perfect concept, a patch that lights up veins to aid medical professionals in drawing blood. “I think with the emergence of ultrasonic and infrared technology our idea was really overlooked. We intend for the venipuncture assistance patch to be a tool utilized in hospitals as large as Johns Hopkins to overseas military bases to third world developing countries. For a procedure as simple as the venipuncture, there should be a simple solution that is universally available,” explained Negrete. Mustafa Al-Adhami M.S. ’15 and current Ph.D. student, mechanical engineering, and his partner Ben Pushon-Smith M.S. ’17, electrical engineering, were awarded second place for their Neuro-Stablyzer concept. Utilizing virtual reality technology, the Neuro-Stablyzer would combat the symptoms of PTSD through game play by directly targeting the areas of the brain most affected. Their goal is to offer an alternative solution to those suffering from PTSD that wouldn’t be as traumatic as traditional treatment or require medication. 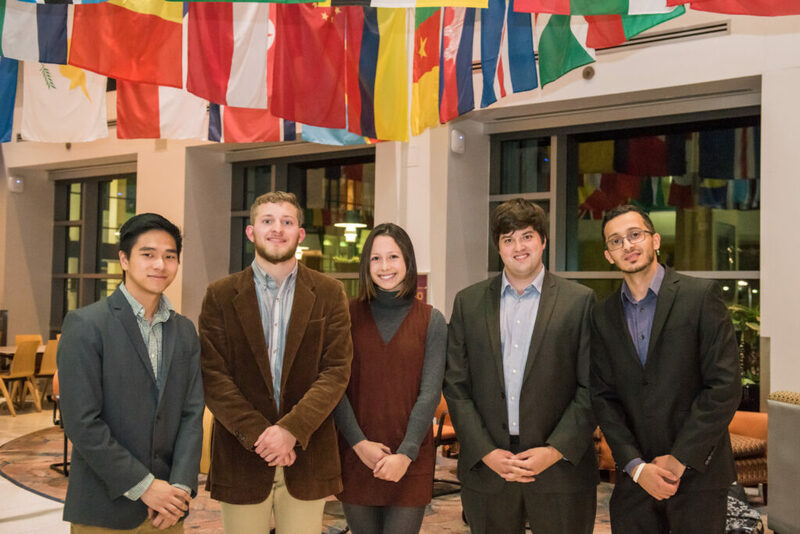 Third place winner Vincent Celebrado-Royer ’18, business technology administration, brought his idea to the table with the Skanaroo app he developed. Skanaroo buttons are designed to be affixed to an easily visible accessory like a backpack. Each button is customized with a QR code that leads to a student organization’s landing page, with the idea that passersby will scan to learn more. Celebrado-Royer has already developed a fully functional product and website and has found success in marketing his invention to various clubs on the UMBC campus. In addition to his third place award, Celebrado-Royer also won best presentation. Banner image: Participants in the 2017 Alex. Brown Center for Entrepreneurship Idea Competition. All photos by Marlayna Demond ‘11 for UMBC.